Sahar lives in a multifaith community where Muslims, Christians, and Jews live together and work for social justice. She Muslim and was raised in a multifaith environment- including attending Catholic schools. Her mother got her Ph.D. at the University of Pittsburgh and, during this time, Sahar describes herself as living in a little bubble in her mosque. She describes female empowerment becoming more of a concept outside of her circle when she went to Catholic school where she was taught in a way where it was okay to be whomever you want to be. 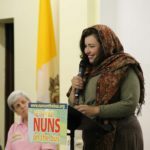 She notes the impact Catholic sisters have had in her early life, how a priest encouraged her to seek deeper into the Qur'an to deepen her own faith, and how the community supported her spiritual development and Muslim faith. She describes how her parents, whom she calls "very modern," were still very concerned about living in American society. Because of this she had to go to the local college across the street. She was devastated by this, but Sister Marie told her, "It's not where you study, it's what you make out of where you are, and how you live in your faith and how you act out your faith." and to not "forget about what we taught you and to be the best representative of the Muslim faith that you can be." Sahar cites a favorite verse of hers from the Qur'an, "I shall not lose sight of the labor of any of you who labors in My way, be it man or woman; each of you is equal to the other in the sight of me, whether it be man or woman." (3:195) From that verse she has taken that how can men and women not be treated equally on earth on how we strive for justice if they will be judged equally on their duties at the Day of Judgment. When her children went to college she moved from television and into the interfaith social justice arena. Since then she has learned more of how to deepen her own Muslim faith from the other faith traditions, and she credits this to her Catholic school past. She ends with another Quran verse (49:19) detailing the importance of diversity and working together in good faith.